I read with great interest the recent article by Steadman et al1 published in the May 1998 issue of the ARCHIVES. 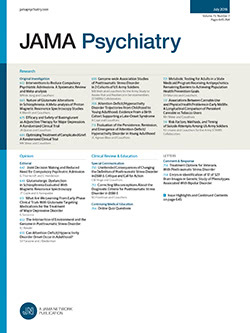 The finding of substance abuse being a major risk factor for violence in patients with a major mental disorder, especially schizophrenia, is not only confirmed by the English-language literature quoted by Steadman et al but also by many other clinical and epidemiological studies.2-5 In a recent article Scott et al2 reported results of a follow-up study in a comparatively small community sample of psychotic patients. Individuals with a dual diagnosis were significantly more likely to report a history of committing an offense or recent hostile behavior. In a subsequent analysis of the data of 2 large samples of schizophrenic patients (N=447 and N=1923,4) it was shown that patients with comorbid substance abuse had been convicted more often than other schizophrenic patients (40.1% vs 13.7%). Lindquist and Allebeck5 in a study of 644 schizophrenic patients also reported a 4 times higher rate of violent offenses among male schizophrenic patients compared with the general population. Prevalence rates for substance abuse in violent offenders (38%) were significantly higher compared with other schizophrenic patients (16%). In a recent 15- to 33-year follow-up study of 1276 former adolescent psychiatric inpatients Kjelsberg and Dahl6 clearly demonstrated that delinquency was highest in patients with disruptive behavior disorder and psychoactive substance use disorder or comorbidity of the 2 disorders (70%-74%). A possible methodological problem of the Steadman et al1 study should be emphasized: Due to Berkson's bias there is a tendency for this material to include a preponderance of comorbid patients (37.6%) which may account for high prevalence rates for violence. The authors discuss several possible biases that may have resulted in lower prevalence rates for violence in their sample but this bias may also have caused the opposite effect.